The PAP government has come down hard on the Chicken distributors and accusing them of price fixing. However, when it comes to petrol companies which are just too obviously acting like a big powerful cartel, defying world oil price slides to maintain a relatively high petrol prices with the blessing as well as SQUEEZING from PAP government by an additional petrol tax, PAP government kept absolutely quiet about it. Why? It has enormous vested interests in keeping petrol prices high and it was the one which imposed additional petrol taxes! Well, let's get back to poultry. Pork was banned from Malaysia since late 1990s when Nipah Virus broke out. But since then, there is no more outbreak of Nipah virus in Malaysia for the past 16 years and yet, pork is still banned from Malaysia up till now. There is vested interests for some stakeholders who own or trade in pork from nearby Indonesia pig farms. Henipahvirus, which was in the same family of Nipah virus, was first found in Australia, outbreak among horses. Nipah virus can infect other animals other than pigs. 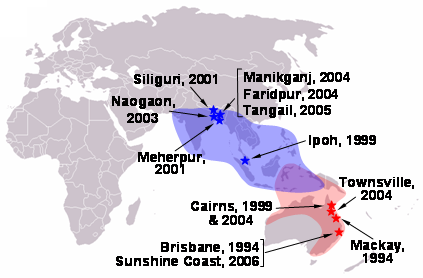 Since 1999 Malaysian outbreak of Nipah virus, there were numerous outbreaks of Nipah and Henipahvirus in Bangladesh and Australia (Townsville 2004, Sunshine Coast 2004, Cairns 1999/2004). Latest updates for 2014, there were a total of 50 outbreaks of Hendra Virus (same family) in Australia! However, there were no ban of poultry, lest long term ban of poultry products (including pork, lamb, beef etc) from Australia, unlike the ban on pork from Malaysia. Why? This is the reason why Singaporeans are suffering from higher priced pork when one main cheaper source of pork from Malaysia was totally banned. While we would expect cost of rearing pigs in Indonesia would be cheaper but due to the monopolistic nature, someone is enjoying high extraordinary profits from this protected and controlled trade in pork. Nobody has died from Nipah Virus in Malaysia since 1999, either from consuming pork or working in pig farms. So why is PAP still banning pork from Malaysia for more than 16 years? One last ironic comparisons. PAP have banned pork from Malaysia due to one Nipah Virus outbreak in Malaysia happened more than 16 years ago which will not have lasting effect than nuclear radiation but PAP has decided to allow primary products from Fukushima Japan to be imported while the nuclear disaster has long lasting devastating impact on farm produce. Got logic? Afternote: A friend of mine message me an update on the ban of pork from Malaysia. Singapore has allowed FROZEN pork from Sarawak since May 2015. (Read: http://www.straitstimes.com/singapore/first-batch-of-frozen-pork-from-malaysia-since-1999) However, this is far from allowing FRESH pork import from West Malaysia which will be cheaper and provided much better price competitiveness to the current situation. If AVA could make assessment and inspections on the pig farms in Sarawak, I do not understand why they could not do so in West Malaysia as well. You forgot to mention the Singapore Food Industries an arm of the govt which supplies all the airflown pork from Australia to NTUC Fairprice. Fairprice supermarkets is the biggest supermarket chain in Singapore.